One of the most important pieces of equipment for cleaning up biohazards is “personal protective equipment” or PPE. 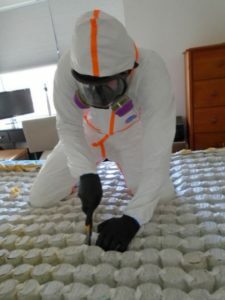 Instead of just one protective piece of clothing, PPE actually refers to a whole host of protective gear including a suit, gloves, self-contained respirators, eye protection, boots, and hoods that are non-porous and will protect the wearer from anything harmful infiltrating through the suit. What PPE we wear depends on the job at hand and what the dangers are. The suits we wear at Bio SoCal are certified for exposure to and the cleaning of biohazards and are only worn once and then discarded as regulated medical waste. Others suits sold on the market can be cleaned using precise procedures and reused but is not recommended for Biohazard cleanup work due to the exposure of life threatening contaminates. 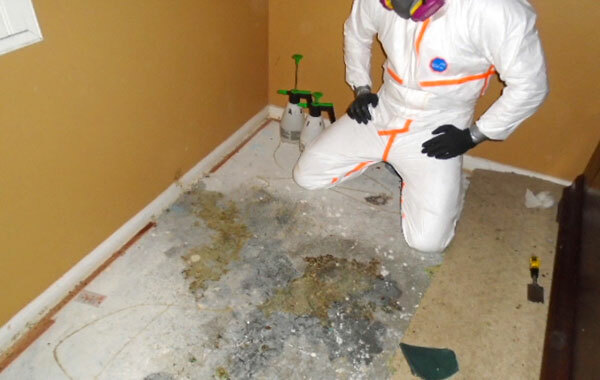 It is important to note that many suits provided to technicians by unqualified cleanup companies claim to be rated for Biohazard Cleanup and simply do not pass all of the critical tests and certifications which exposes the not only client to legal risks but also exposes the health and safety of the technicians. If worn correctly, PPE, or biohazard suits, do a great job of protecting people against biohazards when cleaning up blood, bodily fluids, infectious disease, mold, or other dangers. To be truly safe, though, a person must be extremely careful putting the suit on and especially when taking it off. For example, when wearing gloves with a suit, if even the smallest gap or hole remains in the seal, biohazards can still find their way inside the suit and harm the wearer so precautions and techniques are used to prevent this type of exposure. In fact, it is so important to be careful and exacting when donning the suit that people who wear them have to practice putting it on and off to make sure they do it right every time because any risk can lead to sickness or be fatal. As careful as you must be when putting on the suit and all PPE, you must be even more careful when taking it off. Bio SoCal technicians wear two pairs of gloves and a double layer of booties for protection but also so when the technicians must leave the contaminated scene he or she can remove the top, contaminated layer and still have protection while not cross contaminating the scene with biohazards. Once the job is done and the area is cleaned, anything dangerous can remain on the surface of the suit. Thus, the entire biohazard suit must be removed without touching anything on the outside surface and all biohazards must be kept away from the skin and respiratory systems. This procedure takes two people who are both well-trained in how to remove protective clothing while ensuring the wearer is safe. It’s usually during this part of the cleanup that people are at the highest risk of coming into contact with blood born pathogens or other dangerous contaminates. Only people knowledgeable in how to properly put on and take off PPE should use biohazard suits. What Are Biohazard Suits Made Of? What Is It Like To Work In A Biohazard Suit? Whenever we’re cleaning up after a traumatic event and Biohazards are present, we always put safety first. 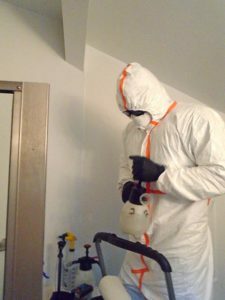 The PPE we use along with the proper techniques of putting them on and taking them off is vital in protecting ourselves against the various biohazards we’re handling while we also protect the health and safety of our clients, their associates and any other contractors that may need to work inside then environment.